I use this Paleo tortillas recipe all the time. I make a big batch and keep them on hand for tacos, burritos, wraps, fajitas, enchiladas or in place of bread. My six-year-old daughter especially loves tortillas, but she’s found it really hard since we try to eat Paleo as much as possible. She really misses bread, tortillas, pizza and all the things related to grains. I mean, don’t we all? So I came up with this Paleo Tortillas Recipe because I wanted a Paleo bread-type carb that was relatively quick and versatile. I mean, just think of all the things you can use a tortilla for – wraps, burritos, tacos, plain (my children’s favorite way) – or in place of things like naan bread or pitas. Actually, my all-time favorite use for this Paleo Tortillas Recipe for a pizza crust. Think crisp, low carb and easy individual pizzas. Try it! So, a little story about this Paleo Tortillas Recipe. Last night my six-year-old daughter asked my husband to take her training wheels off her little 12″ bike. She tried riding it a bit without much luck before bed. Yesterday was her last day of school, so this morning she wanted to ride her bike really bad, but it just wasn’t working at our house. She had a really hard time staying on the sidewalk and getting started, but I could tell she was almost there. So I decided it was time to do what I had done with all my other children – take them to the church by our house. This church has had the perfect, slight incline for a long time in the parking lot. It’s the perfect place to practice riding a bike because I don’t have to do things like hold on her bike and let go and have her get mad at me that I let go. I always start my children out on a tiny, tiny bike so it’s not scary. I just tell them if they start to fall then to put their legs down. So helps with the fear. She got it on the first time down the hill. She went down the hill no problem and then said she wanted to ride around the church, which I figured would be a disaster – but it wasn’t! She went all the way around the church in like a minute and came back so, so proud of herself. After about a half hour of that, she said she wanted to try the big 16″ inch bike. I figured it was worth a try, so we went and got that and went back to the church with the big bike and she got that down right away. Then we went home and she’s been riding around the neighborhood all afternoon! I thought I would reward her with these Paleo tortillas. After all, all that hard work can really work up an appetite. It’s not her first time eating them, but she gobbled them up then ran off to ride her bike to her grandma’s house and show off her new skill. Have you learned something new recently that you’re proud of? I would love to hear your accomplishments in the comments below. These Paleo tortillas are really good. 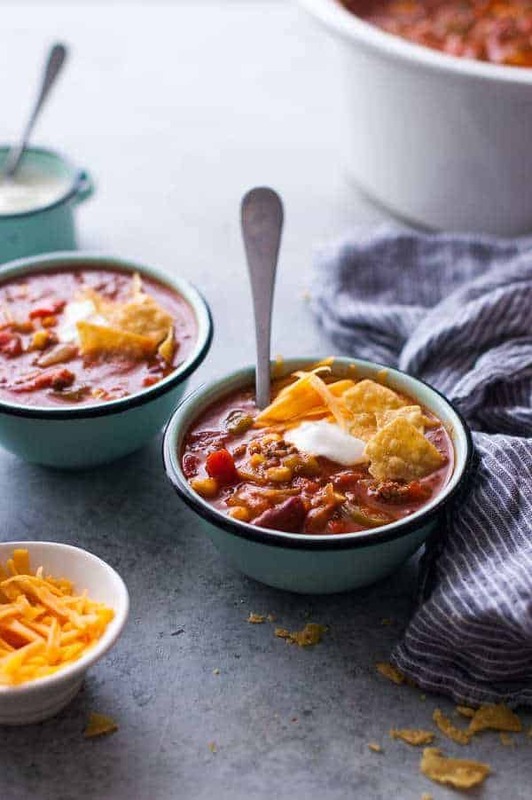 I like to make a bunch ahead of time and have them on hand for lunch, between meals, breakfast burritos or for all sorts of dinner uses, like tacos, burritos, wraps, fajitas, enchiladas – or even in place of naan, pitas or bread. Because they are a lot easier to make than bread and store better. Because the dough lacks gluten, and is therefore much more delicate, I have written in very specific instructions on how to roll them out without tearing or breaking. Place the flour blend, tapioca starch, sea salt, and baking powder in the bowl of a food processor. Process for a few seconds to combine. 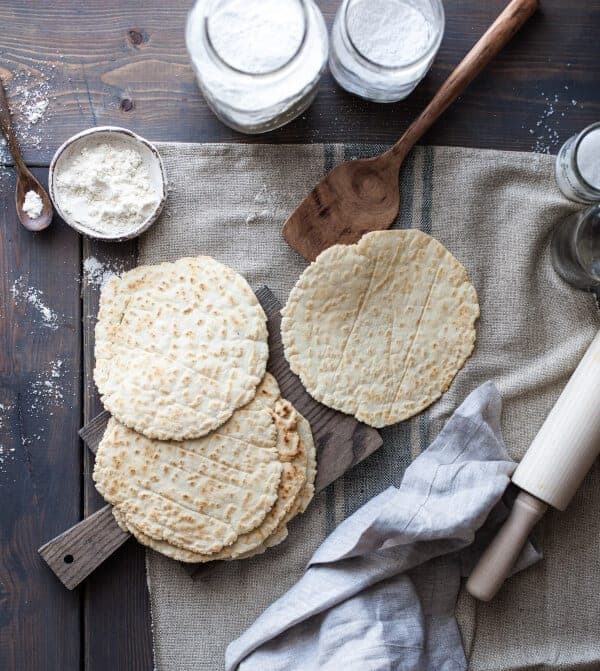 Shape the dough into a flat disc, wrap with plastic wrap, and refrigerate for one hour. Divide the cold dough into 8 equal balls. Dust a piece of parchment paper with tapioca starch. Place a dough ball on the parchment, flatten slightly with your hand, and sprinkle the top with more tapioca starch. Place another piece of parchment paper on top of the dough and roll twice. Peel the paper off of the dough, set it down again, and flip the dough over(should still be sandwiched in between parchment paper). Peel the parchment carefully off of the dough and set back down again. Roll twice in the opposite direction you rolled last time. 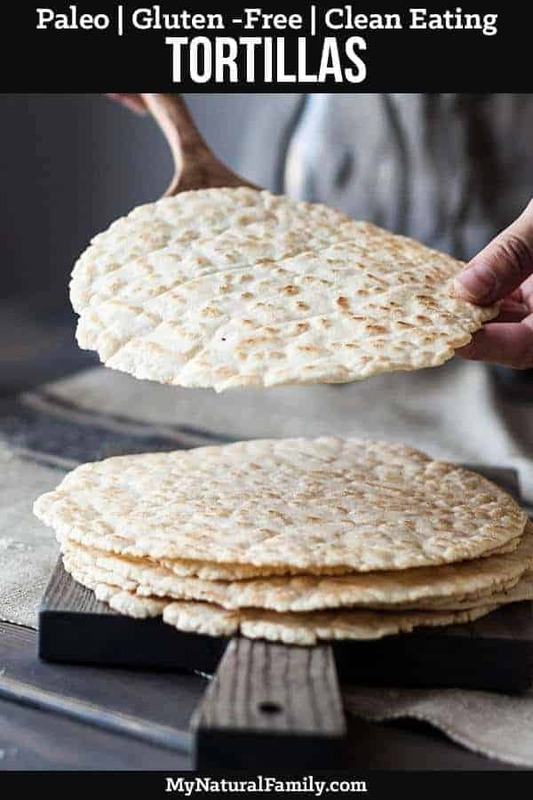 Peel the parchment carefully off of the dough, set back down, flip, peel the parchment off of that side, set back down, and continue to repeat the process until you have a tortilla that is 6-7 inches in diameter. Once the tortilla has been rolled out, keep it on the parchment paper as this will help you flip it onto the pan to cook. 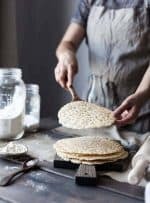 Rolling the dough out with this method will help your tortilla not to stick to the parchment or tear as easily since paleo dough is very delicate and difficult to work with without the help of gluten to hold it together. Repeat this process with each dough ball until you have 8 dough discs that are ready to cook. ​Hea​t a skillet or frying pan to medium/high. When the pan is hot, place a tortilla in your palm with the parchment in between your hand and tortilla. Flip the tortilla onto the hot pan so that the parchment paper is on top. Carefully peel off the parchment and discard. Cook the tortilla for about 30 seconds on each side, or until each side has developed golden brown bubbles over the surface. Repeat with the remaining tortillas. Store the tortillas in an airtight container or ziplock bag. 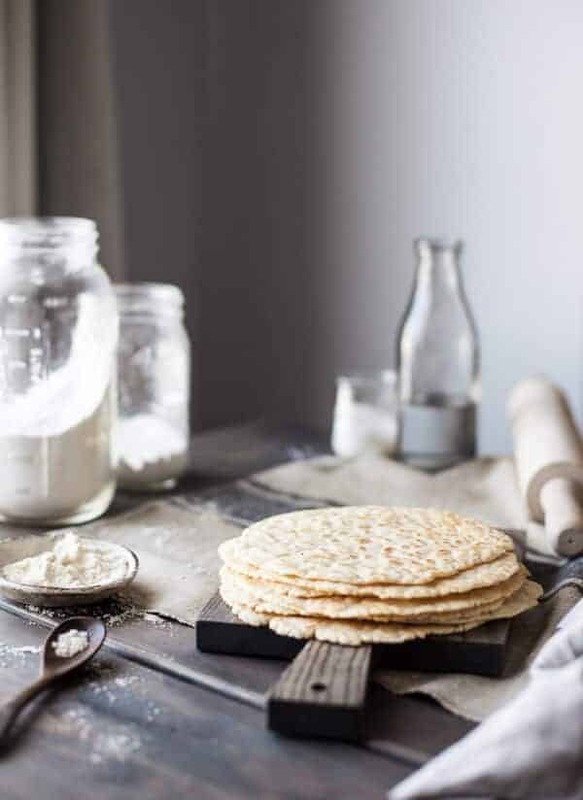 **I used a store-bought paleo flour blend for these tortillas that included almond flour, tapioca starch, coconut flour, and arrowroot powder. Bob’s Red Mill makes a paleo flour blend that would work, as well. Hi, I am going to try this recipe but don’t see coconut flour listed as one of the ing. yet it says to let it sit to allow the coconut flour absorb? What am I missing? There is coconut flour in the Paleo flour all-purpose blend. I used olive oil instead of butter. Also just kinda flattened them like pancake size with my hands right after processing. I was hungry and couldn’t wait. They are delicious. Once I got past the image I decided to try them and they were actually very good. Give them a try everyone!